Archaeological investigation has found evidence of irrigation in areas lacking sufficient natural rainfall to support crops for rainfed agriculture. The earliest known use of the technology dates to the 6th millennium BCE in Khuzistan in the south-west of present-day Iran. Irrigation was used as a means of manipulation of water in the alluvial plains of the Indus valley civilization, the application of it is estimated to have begun around 4500 BC and drastically increased the size and prosperity of their agricultural settlements. The Indus Valley Civilization developed sophisticated irrigation and water-storage systems, including artificial reservoirs at Girnar dated to 3000 BCE, and an early canal irrigation system from c. 2600 BCE. Large-scale agriculture was practiced, with an extensive network of canals used for the purpose of irrigation. Farmers in the Mesopotamian plain used irrigation from at least the third millennium BCE. They developed perennial irrigation, regularly watering crops throughout the growing season by coaxing water through a matrix of small channels formed in the field. Ancient Egyptians practiced basin irrigation using the flooding of the Nile to inundate land plots which had been surrounded by dykes. The flood water remained until the fertile sediment had settled before the engineers returned the surplus to the watercourse. There is evidence of the ancient Egyptian pharaoh Amenemhet III in the twelfth dynasty (about 1800 BCE) using the natural lake of the Faiyum Oasis as a reservoir to store surpluses of water for use during dry seasons. The lake swelled annually from the flooding of the Nile. 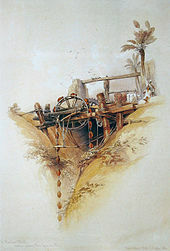 The Ancient Nubians developed a form of irrigation by using a waterwheel-like device called a sakia. Irrigation began in Nubia some time between the third and second millennia BCE. It largely depended upon the flood waters that would flow through the Nile River and other rivers in what is now the Sudan. In sub-Saharan Africa irrigation reached the Niger River region cultures and civilizations by the first or second millennium BCE and was based on wet-season flooding and water harvesting. Evidence of terrace irrigation occurs in pre-Columbian America, early Syria, India, and China. In the Zana Valley of the Andes Mountains in Peru, archaeologists have found remains of three irrigation canals radiocarbon-dated from the 4th millennium BCE, the 3rd millennium BCE and the 9th century CE. These canals provide the earliest record of irrigation in the New World. Traces of a canal possibly dating from the 5th millennium BCE were found under the 4th-millennium canal. Ancient Persia (modern day Iran) used irrigation as far back as the 6th millennium BCE to grow barley in areas with insufficient natural rainfall. [need quotation to verify] The Qanats, developed in ancient Persia about 800 BCE, are among the oldest known irrigation methods still in use today. They are now found in Asia, the Middle East and North Africa. The system comprises a network of vertical wells and gently sloping tunnels driven into the sides of cliffs and of steep hills to tap groundwater. The noria, a water wheel with clay pots around the rim powered by the flow of the stream (or by animals where the water source was still), first came into use at about this time among Roman settlers in North Africa. By 150 BCE the pots were fitted with valves to allow smoother filling as they were forced into the water. The irrigation works of ancient Sri Lanka, the earliest dating from about 300 BCE in the reign of King Pandukabhaya, and under continuous development for the next thousand years, were one of the most complex irrigation systems of the ancient world. In addition to underground canals, the Sinhalese were the first to build completely artificial reservoirs to store water. These reservoirs and canal systems were used primarily to irrigate paddy fields, which require a lot of water to cultivate. Most of these irrigation systems still exist undamaged up to now, in Anuradhapura and Polonnaruwa, because of the advanced and precise engineering. The system was extensively restored and further extended[by whom?] during the reign of King Parakrama Bahu (1153–1186 CE). The oldest known hydraulic engineers of China were Sunshu Ao (6th century BCE) of the Spring and Autumn period and Ximen Bao (5th century BCE) of the Warring States period, both of whom worked on large irrigation projects. In the Sichuan region belonging to the state of Qin of ancient China, the Dujiangyan Irrigation System devised by the Qin Chinese hydrologist and irrigation engineer Li Bing was built in 256 BCE to irrigate a vast area of farmland that today still supplies water. By the 2nd century AD, during the Han Dynasty, the Chinese also used chain pumps which lifted water from a lower elevation to a higher one. These were powered by manual foot-pedal, hydraulic waterwheels, or rotating mechanical wheels pulled by oxen. The water was used for public works, providing water for urban residential quarters and palace gardens, but mostly for irrigation of farmland canals and channels in the fields. Korea, Jang Yeong-sil, a Korean engineer of the Joseon Dynasty, under the active direction of the king, Sejong the Great, invented the world's first rain-gauge, uryanggye (Korean:우량계) in 1441. It was installed in irrigation tanks[by whom?] as part of a nationwide system to measure and collect rainfall for agricultural applications. With this instrument, planners and farmers could make better use of the information gathered in the[which?] survey. Surface irrigation is the oldest form of irrigation and has been in use for thousands of years. 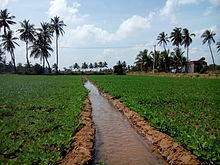 In surface ( flood, or level basin) irrigation systems, water moves across the surface of an agricultural lands, in order to wet it and infiltrate into the soil. Surface irrigation can be subdivided into furrow, border strip or basin irrigation. It is often called flood .irrigation when the irrigation results in flooding or near flooding of the cultivated land. Historically, this has been the most common method of irrigating agricultural land and is still used in most parts of the world. As of 2017[update] most center pivot systems have drops hanging from a U-shaped pipe attached at the top of the pipe with sprinkler heads that are positioned a few feet (at most) above the crop, thus limiting evaporative losses. 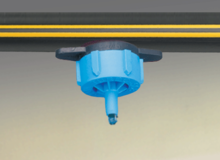 Drops can also be used with drag hoses or bubblers that deposit the water directly on the ground between crops. Crops are often planted in a circle to conform to the center pivot. This type of system is known as LEPA (Low Energy Precision Application). Originally, most center pivots were water-powered. These were replaced by hydraulic systems (T-L Irrigation) and electric-motor-driven systems (Reinke, Valley, Zimmatic). Many modern pivots feature GPS devices. An impact sprinkler watering a lawn, an example of a hose-end sprinkler. Another type of subirrigation is the self-watering container, also known as a sub-irrigated planter. This consists of a planter suspended over a reservoir with some type of wicking material such as a polyester rope. The water is drawn up the wick through capillary action. A similar technique is the wicking bed; this too uses capillary action. 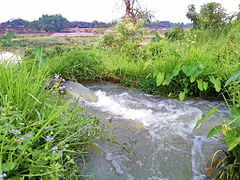 Irrigation is underway by pump-enabled extraction directly from the Gumti, seen in the background, in Comilla, Bangladesh. Assisting smallholders in sustainably and collectively managing irrigation technology and changes in technology. ^ Snyder, R. L.; Melo-Abreu, J. P. (2005). Frost protection: fundamentals, practice, and economics. Volume 1. Food and Agriculture Organization of the United Nations. ISBN 978-92-5-105328-7. ISSN 1684-8241. ^ Williams, J. F.; S. R. Roberts; J. E. Hill; S. C. Scardaci; G. Tibbits. "Managing Water for 'Weed' Control in Rice". UC Davis, Department of Plant Sciences. Archived from the original on 2007-04-03. Retrieved 2007-03-14. ^ "Arid environments becoming consolidated". Retrieved 2012-06-19. ^ Flannery, Kent V. (1969). "Origins and ecological effects of early domestication in Iran and the Near East". In Ucko, Peter John; Dimbleby, G. W. (eds.). The Domestication and Exploitation of Plants and Animals. New Brunswick, New Jersey: Transaction Publishers (published 2007). p. 89. ISBN 9780202365572. Retrieved 2019-01-12. ^ Lawton, H. W.; Wilke, P. J. (1979). "Ancient Agricultural Systems in Dry Regions of the Old World". In Hall, A. E.; Cannell, G. H.; Lawton, H.W. (eds.). Agriculture in Semi-Arid Environments. Ecological Studies. 34 (reprint ed.). Berlin: Springer Science & Business Media (published 2012). p. 13. ISBN 9783642673283. Retrieved 2019-01-12. ^ (Italy), Consiglio nazionale delle ricerche; Science?, Symposium on the Basis of Civilization—Water (2004). The Basis of Civilization—water Science?. International Association of Hydrological Science. ISBN 9781901502572. ^ "Ancient India Indus Valley Civilization". Minnesota State University "e-museum". Archived from the original on 2007-02-05. Retrieved 2007-01-10. ^ Crawford, Harriet, ed. (2013). The Sumerian World. Routledge Worlds. Abingdon, Oxfordshire: Routledge. ISBN 9781136219115. Retrieved 2019-01-12. ^ Hill, Donald (1984). 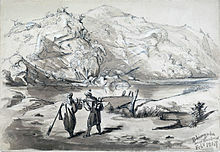 "2: Irrigation and Water supply". A History of Engineering in Classical and Medieval Times (reprint ed.). London: Routledge (published 2013). p. 18. ISBN 9781317761570. Retrieved 2019-01-12. ^ "Amenemhet III". Britannica Concise. Archived from the original on 2007-05-10. Retrieved 2007-01-10. ^ G. Mokhtar (1981-01-01). Ancient civilizations of Africa. Unesco. International Scientific Committee for the Drafting of a General History of Africa. p. 309. ISBN 9780435948054. Retrieved 2012-06-19 – via Books.google.com. ^ "Traditional technologies". Fao.org. Retrieved 2012-06-19. ^ "Africa, Emerging Civilizations In Sub-Sahara Africa. Various Authors; Edited By: R. A. Guisepi". History-world.org. Retrieved 2012-06-19. ^ The History of Technology – Irrigation. Encyclopædia Britannica, 1994 edition. ^ "Qanat Irrigation Systems and Homegardens (Iran)". Globally Important Agriculture Heritage Systems. UN Food and Agriculture Organization. Retrieved 2007-01-10. ^ de Silva, Sena (1998). "Reservoirs of Sri Lanka and their fisheries". UN Food and Agriculture Organization. Retrieved 2007-01-10. ^ China – history. Encyclopædia Britannica,1994 edition. ^ Needham, Joseph (1986). Science and Civilization in China: Volume 4, Physics and Physical Technology, Part 2, Mechanical Engineering. Taipei: Caves Books Ltd. Pages 344–346. ^ Needham, Volume 4, Part 2, 340–343. ^ Needham, Volume 4, Part 2, 33, 110. ^ Baek Seok-gi 백석기 (1987). Jang Yeong-sil 장영실. Woongjin Wiin Jeon-gi 웅진위인전기 11. Woongjin Publishing Co., Ltd.
^ "Earliest Canals in America – Archaeology Magazine Archive". ^ James M. Bayman, "The Hohokam of Southwest North America." Journal of World Prehistory 15.3 (2001): 257–311. 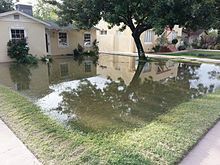 ^ "Flood Irrigation Service". City of Tempe, Arizona. Retrieved 29 July 2017. ^ Frenken, K. (2005). Irrigation in Africa in figures – AQUASTAT Survey – 2005 (PDF). Food and Agriculture Organization of the United Nations. ISBN 978-92-5-105414-7. Retrieved 2007-03-14. ^ Provenzano, Giuseppe (2007). "Using HYDRUS-2D Simulation Model to Evaluate Wetted Soil Volume in Subsurface Drip Irrigation Systems". J. Irrig. Drain Eng. 133 (4): 342–350. doi:10.1061/(ASCE)0733-9437(2007)133:4(342). ^ Mader, Shelli (May 25, 2010). 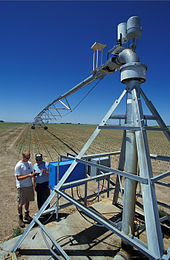 "Center pivot irrigation revolutionizes agriculture". The Fence Post Magazine. Retrieved June 6, 2012. ^ Gaines, Tharran (January 7, 2017). "GPS SWING ARMS PROVE THEIR WORTH". Successful Farming. Retrieved February 1, 2018. ^ Peters, Troy. "Managing Wheel ‐ Lines and Hand ‐ Lines for High Profitability" (PDF). Retrieved 29 May 2015. ^ Hill, Robert. "Wheelmove Sprinkler Irrigation Operation and Management" (PDF). Retrieved 29 May 2015. ^ "Polyester ropes natural irrigation technique". Entheogen.com. Archived from the original on April 12, 2012. Retrieved 2012-06-19. ^ "DIY instructions for making self-watering system using ropes". Instructables.com. 2008-03-17. Retrieved 2012-06-19. 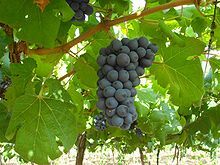 ^ "Water use efficiency - agriwaterpedia.info". ^ "Reengaging in Agricultural Water Management: Challenges and Options". The World Bank. pp. 4–5. Retrieved 2011-10-30. ^ Rosegrant, Mark W., and Hans P. Binswanger. "Markets in tradable water rights: potential for efficiency gains in developing country water resource allocation." World development (1994) 22#11 pp: 1613–1625. ^ "A new report says we're draining our aquifers faster than ever". High Country News. 2013-06-22. Retrieved 2014-02-11. ^ "Management of aquifer recharge and discharge processes and aquifer storage equilibrium" (PDF). 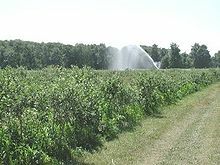 ^ Drainage Manual: A Guide to Integrating Plant, Soil, and Water Relationships for Drainage of Irrigated Lands. 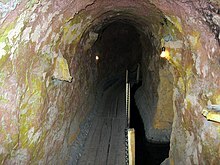 Interior Dept., Bureau of Reclamation. 1993. ISBN 978-0-16-061623-5. ^ "Free articles and software on drainage of waterlogged land and soil salinity control in irrigated land". Retrieved 2010-07-28. ^ Venot, Jean-Philippe (2017-07-06). Drip Irrigation for Agriculture. doi:10.4324/9781315537146. ISBN 9781315537146. ^ Bentzen, Jeanet Sinding; Kaarsen, Nicolai; Wingender, Asger Moll (2016-06-01). "Irrigation and Autocracy". Journal of the European Economic Association: n/a. doi:10.1111/jeea.12173. ISSN 1542-4774. Agricultural Water Management, ISSN 0378-3774, Elsevier. "Irrigation" . Encyclopædia Britannica. 14 (11th ed.). 1911. pp. 841–853.